Common knowledge refers to that which is known by most people, something basic that is universally understood. 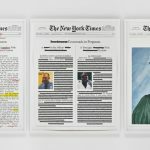 In choosing to title his exhibition Common Knowledge, David McDonald set out to create a suite of artworks that could be approached and understood on their own grounds. 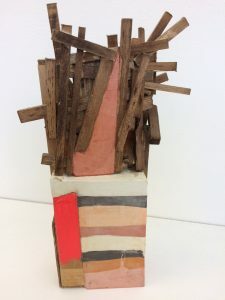 Their shapes, colors and materials provide enough of an entry point for viewers to form their own interpretations and appreciation of the works. McDonald has a Zen approach to art making, and rather than make works that reference the identifiable, he works more abstractly and intuitively using tropes from free form jazz and thinking about rhythm and repetition. On view in Common Knowledge are sculptures from multiple interrelated bodies of recent work, as well as a selection of watercolors. Arranged on a shelf along the back wall of the space are small works no higher than ten inches that McDonald calls Compacts (all 2017). These magical sculptures evocatively combine fragments of different types and polishes of wood with tinted Hydrocal. Sometimes, as in Compacts #21 the striated Hydrocal serves as the support for a flutter of criss-crossing square dowels that extend up from the gray, tan, white and orange pigmented base. 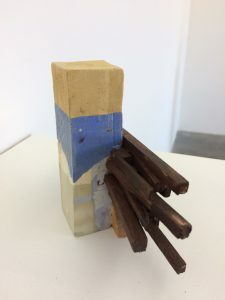 In other works, including Compacts #4, the small Hydrocal column is bisected by horizontal wooden shards. These sculptures are messy but controlled. 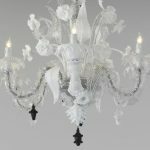 They are like three-dimensional doodles, where McDonald has the freedom to experiment with the spontaneous grouping of disparate forms and materials, putting them together as abstract ditties. 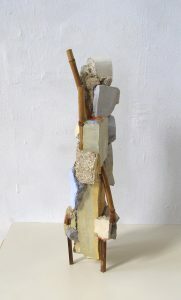 Placed atop low risers are sculptures McDonald has titled Ten Stages of Understanding. 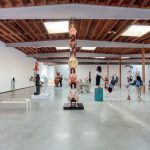 Many of these floor-based works extend vertically from a cylindrical base. Here, McDonald gracefully assembles bamboo, Hydrocal, wood, sand and Polyurethane to create ungainly shapes that balance each other in inventive ways. A conversation about process and the relationships that occur through the juxtaposition of myriad textures, materials and colors ensues. As per McDonald’s intent, the works do not reference anything specific or identifiable, rather they are like personal totems or animated koans with multiple associations. They feel architectural, in that they have a structure, yet they do not follow any prescribed plan or geometry. 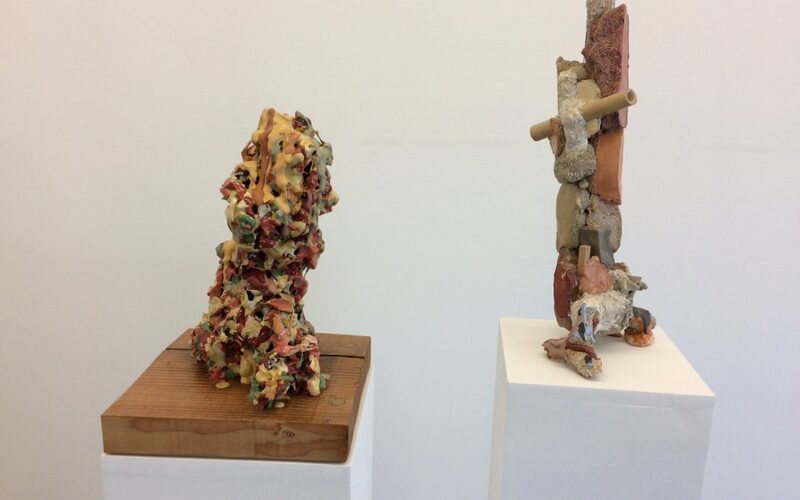 In a corner McDonald has placed two sculptures on separate waist high pedestals— Untitled (Drip Drip #3), (2018) and 1 + 1 = 3 #2 (2017), the latter a slender assemblage of irregularly cast Hydrocal shapes attached to a central wooden stake. The forms are cobbled together in a casual yet assertive manner. While less than two-feet high, 1 + 1 = 3 #2 is quasi-rigid and upright. Nevertheless, it alludes to a dilapidated tower. 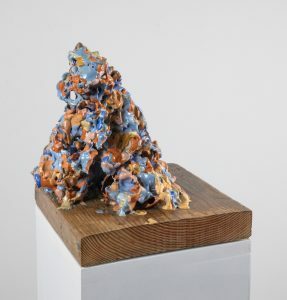 Seen together, it is easy to imagine Untitled (Drip Drip #3) as the tower fully melted down. Here, McDonald has allowed earth-toned drips and blobs of Hydrocal to adhere to a wire and tinfoil core, covering this internal scaffolding. 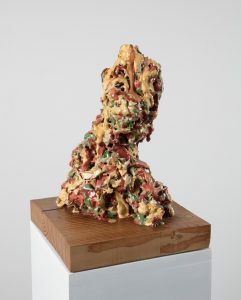 In some ways, this piece alludes to what could be the remains of a Jeff Koons topiary dog. McDonald’s works are about process and materials. There is order in his chaos and he embraces a controlled entropy. This control comes from having intimate knowledge of his materials and how they work together. He begins with a structure and is interested in how it changes or disintegrates over time. 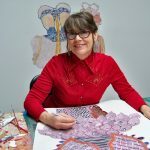 This is evident in a suite of watercolors created during workshops he oversaw at the Veterans Administration. 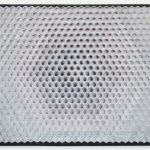 In these open grids, McDonald creates an orange-red lattice that is subsequently filled in with translucent blues, yellows, greens and grays. The overall effect is like the sun reflecting off the windows on a building’s facade. There is a push-pull between the foreground and background in the works as the eye bounces from tone to tone. Between all the pieces in Common Knowledge, McDonald creates a symphony where abstract rhythms and patterns work in concert with each other to transcend time and space, referencing an undefinable other that exists beyond what the eye can see.